GRESHAM — One last race. Danny Bassich and Brandon Hughes were going to make the most of it — and they were going to have fun doing it. 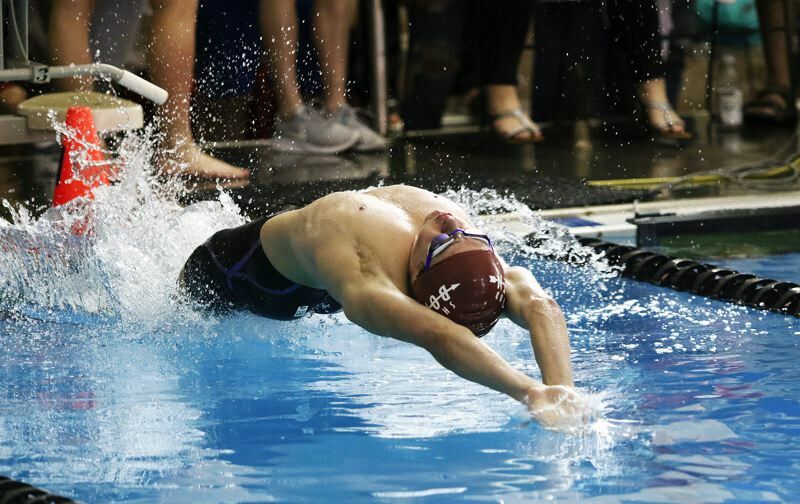 Bassich and Hughes, both Sherwood High School seniors, finished their high school swimming careers together, each reaching the finals in the 100-yard backstroke event at the Class 6A state swimming championships, held Friday and Saturday at Mount Hood Community College. They both earned a spot in Saturday's consolation finals of the event. In that race, Bassich finished in fifth place (putting him 11th overall), in a time of 57.74. Hughes finished in sixth place (12th overall), with a mark of 57.79. "That was a lot of fun," Bassich said after the race. "I smiled more than at any other race," Hughes said. "Danny has trained more years than I have, and he deserved to beat me. When I saw he beat me, I just smiled. Also for the Sherwood boys at the state meet, the 200 medley relay team, consisting of Bassich, Hughes, senior Eugene Tan and junior Ettelstein, finished in 16th place in the preliminaries with a time of 1:45.61. The Sherwood boys, thanks to Bassich and Hughes reaching the backstroke finals, finished in a tie for 29th place in the team standings at the state meet with three points. "We're on the board at state," Bassich said with a smile. The Jesuit boys and the Sunset girls won the Class 6A state team championships.